This is the one you see in most TV tournaments. The player left of the dealer button posts a blind. Players receive two cards face down. There is a betting round starting with the player left of the blind. The dealer turns over three community cards in the middle of the table, followed by another betting round starting with the player left of the dealer button. The dealer will turn over two more community cards (for a total of five community cards), with a bet following both the fourth and the fifth cards. The player who is able to make the best five-card hand using any combination of their own two cards and the board’s five cards wins. The player left of the dealer button posts a blind. Players receive four cards face down. Their first betting round starts with the player left of the blind. 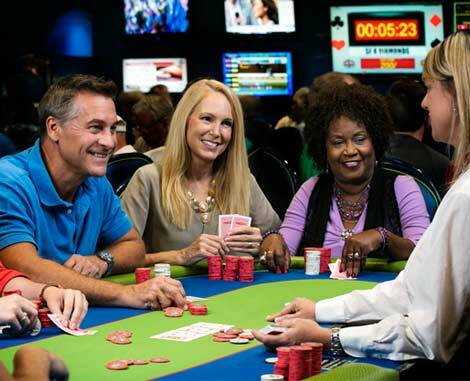 The dealer turns over three community cards in the middle of the table, followed by another betting round that begins with the player left of the dealer button. The dealer will turn over two more community cards, one at a time (for a total of five community cards), followed by betting each time. Each player makes a hand using two cards from their hand and three community cards. No other combination is allowed. The player with the best five-card hand wins. This game is played just like regular Omaha, except the high hand and the low hand split the pot. To qualify for the low hand an eight low (or lower) is needed. If there is no qualifying low hand, the high hand takes the entire pot. 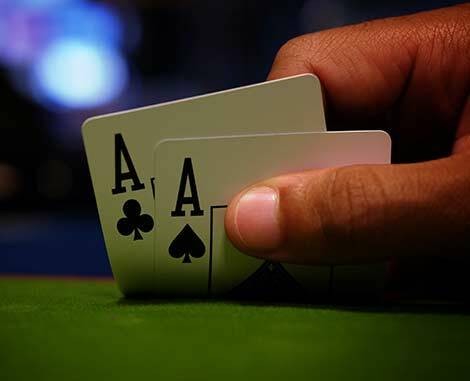 Aces may be used for low, and straights and flushes do not impair the value of a hand for low. (Ace-two-three-four-five is the best low hand). Players two cards from their hand and three community cards to make their hand(s). A player may use two cards from their hand to make the best high hand, and use two cards, whether the same as his/her hand or not, to make their best low hand. Each player receives two cards face down and one card face up. The betting round starts with the low up card. The dealer will deliver four more rounds of cards with a betting round after each round, starting with the high hand. The last card is face down. The best five-card hand out of seven cards wins. This game follows the rules of Seven Card Stud, except the high hand and the low hand split the pot. To qualify for the low hand, an eight low (or lower) is needed. If there is no qualifying low hand, the high hand takes the entire pot. 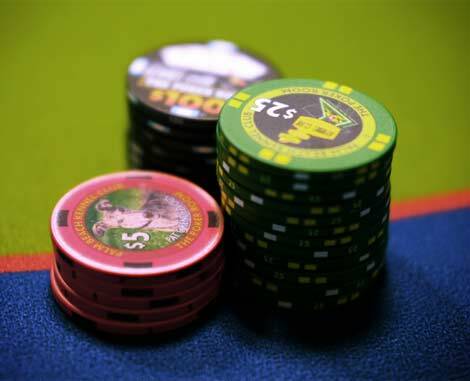 High-low split games use the lower betting limit on the third and fourth cards and the upper limit on the rest of the hand, with an open pair not affecting the limit on the fourth card as in regular Seven Card Stud. Aces may be used for low, and straights and flushes do not impair the value of a hand for low. (Ace-two-three-four-five is the best low hand). A player may use any five of his/her seven cards to make their best high hand, and any other grouping of five cards, whether the same as their high hand or not, to make his/her best low hand In some instances, a player may be able to build both the high and low hand from their seven cards, in which case they take the entire pot. Ask any floor supervisor if you have questions about rules, procedures, games or betting limits. If any player, situation or employee makes you uncomfortable, talk to a floor supervisor. If you are not satisfied, ask to see the Poker Room Manager or Director. All Games where a per hand jackpot fee is taken will qualify for the jackpot. In any raked game a $1 jackpot fee will be taken when a pot reaches $10. and a second $1 will be taken when the pot reaches $20. Jackpot totals will be updated daily and posted in plain view. Both the bad beat and winning hands must be the best possible combination of five cards. In cases where the same hand can be created multiple ways, the player’s hole cards will take priority. Both hole cards must play in any qualifying hand. Player must use a pair in their hand to make 4 of a kind. * Only one jackpot can be awarded per hand and only the two highest ranking hands that qualify will be considered for the jackpot. The following MAY nullify any jackpot being awarded: 1) Any shuffle other than shuffle, shuffle, box, shuffle. 2) Any deck found to contain too many or too few cards.